I was stressed and exhausted, but I was determined to summon all my powers to make dinner at home with ingredients I already had. That means that I had to go from walking in the door after to work to sitting on my couch, eat dinner and watching That 70's Show reruns within about 20 minutes or I'll be starving, grumpy and ordering Pizza Hut delivery online. This also means I mentally prepare what I'm going to make as I'm driving home. I knew I had seasoned tofu in the fridge, but after a bad experience with hickory-flavored tofu a couple months ago, I was a little hesitant. 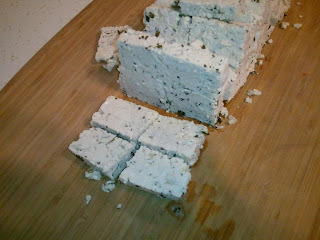 For this recipe, I used garlic-herb organic Good Natured Family Farms tofu. I hope my Price Chopper carries this forever and ever because it's delicious. Amen. Rather than cubing the tofu, this time I cut it in half long-ways, again in half the other long-ways, then in quarters along the shortest side to make little strips. Hopefully this picture makes a little more sense than my words. 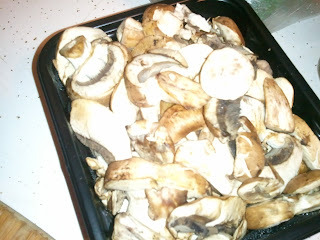 I also picked up these sliced baby portabellas at the store. They're delicious and sometimes I want to be lazy. Plus I think they were the same price as the ones I would have had to slice myself. So I just washed these up and planned to use the whole container. Mmm, 'shrooms. 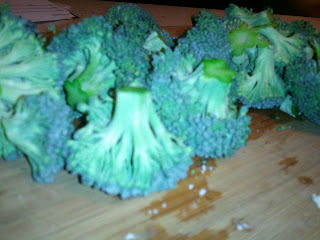 Grant had picked out some organic broccoli at Whole Foods. It's been in the fridge almost a week, so I claimed it. Ohmygod it was delicious in this. You could even use frozen broccoli, but I'd rather use fresh broccoli any time of year, even if it's flown in from some other country or something. Fresh broccoli makes me smile. It's hands-down my favorite vegetable. You could substitute for other veggies or add anything you want. I had an onion, but didn't feel like cutting it up and getting onion-finger smell. Plus I kind of forgot. And I thought of peeling carrots into it, but like I said, I was really exhausted that day. The instructions to this are pretty much my typical mid-week throw-together dinner. I fried the tofu in a little olive oil. This seasoned kind fell apart more than usual, but it was fine. Just don't stir it around as much as you would chicken. 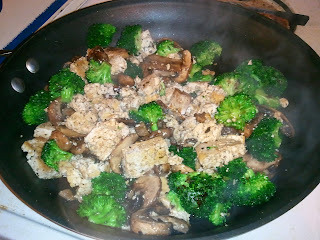 Or if you don't like tofu, use chicken in this! It would be delicious! 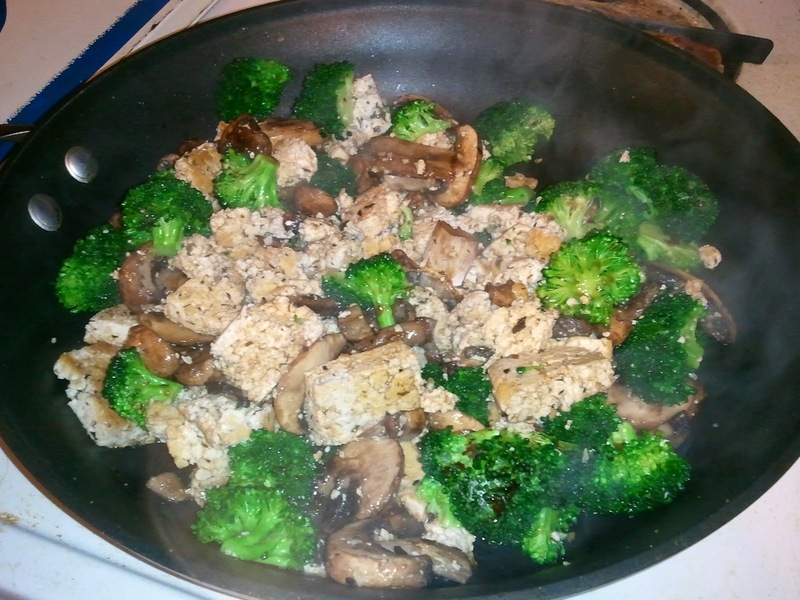 Once your protein (tofu or chicken) is almost done, add a little more oil and the veggies. Cook until it's all done to your liking. Then add soy sauce and mix until everything's coated and steamy. I love soy sauce, so I buy the low-sodium version and use a ton of it. For this, I'd estimate I used just under 1/4 cup. You could serve this over rice or noodles. My brain is much influenced in South Beach thought, so I'm happy with protein and a ton of veggies. This smelled so good that Grant was confused and sad. He doesn't like mushrooms or tofu! 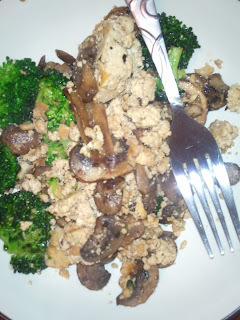 He did pick out a piece of broccoli, flick tofu bits off, eat it and say "yum." This made a good-sized dinner (without sides or rice) and I had leftovers for another full meal. With rice, I think you could feed a family of four. I should also label this dinner "accidentally vegan." I know the v-word scares some people, so those people are welcome to try this with chicken first. But really, if you can handle tofu at all, try it! 1. Slice tofu. Brown in skillet in oil over medium-high. 2. Add a little more oil and veggies. Cook until veggies are bite-tender. 3. Add soy sauce to taste. 4. Serve plain or over rice.